This 4,000 sq ft house of worship became an integral part of Chinmaya Mission Houston's existing 43,000 sq ft facility in December 2007 when Pujya Guruji Swami Tejomayananda inaugurated the temple. The multitudes flocked with devotion as Lord Siva was enshrined in Sri Saumyakasi Sivalaya amidst great pomp and ceremony. This new temple was reverberating with the sounds of chanting and bhajans during the week long inaugural festivities that began on 16th December and concluded on 22nd December. 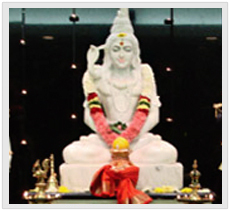 It was Swami Chinmayananda's vision to have a Siva temple erected on the Chinmaya Prabha premises in Houston. 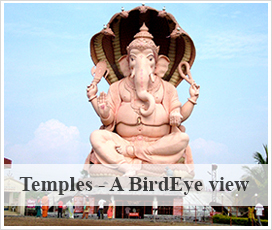 The uniqueness of the temple is that it is a synthesis of two areas, the structure that houses the idols, and the courtyard from which one can view the temple and the deities within. The shrine has a contemporary design. It is a glass structure sitting on a concrete pedestal that rises from a body of water. The statue of Siva is seated 13 feet above the ground. A Shivalinga on the top adds a crowning touch to the monument. The courtyard extends the tranquil ambiance felt within the sanctum sanctorum. Walls on either sides create the feeling of a room open to the skies. Covered walkways furnished with benches flank the beautiful garden. While Sri Saumyakasi Sivalaya is a Siva temple, it is home to Rama, Sita, Radha, Krishna, and Ganesha as well. The temple will benefit the community for many generations to come. It will help foster the Mission to continue to teach and reinforce spiritual and cultural values, to spread the knowledge of Vedanta and Hindu scriptures, and to conduct spiritual and cultural programs that interest all members of the community. Devotees are able to perform ceremonies for special occasions like birthdays and anniversaries. Children are taught how to do Puja and devotees are able to learn the significance of Puja and the Vedantic viewpoint behind different rituals.